Detailing the physical features, habits, territorial reach and other identifying qualities of the Common Looper. The Common Looper Moth has a diverse appetite and cryptic coloring, allowing it to reside in a variety of regions. 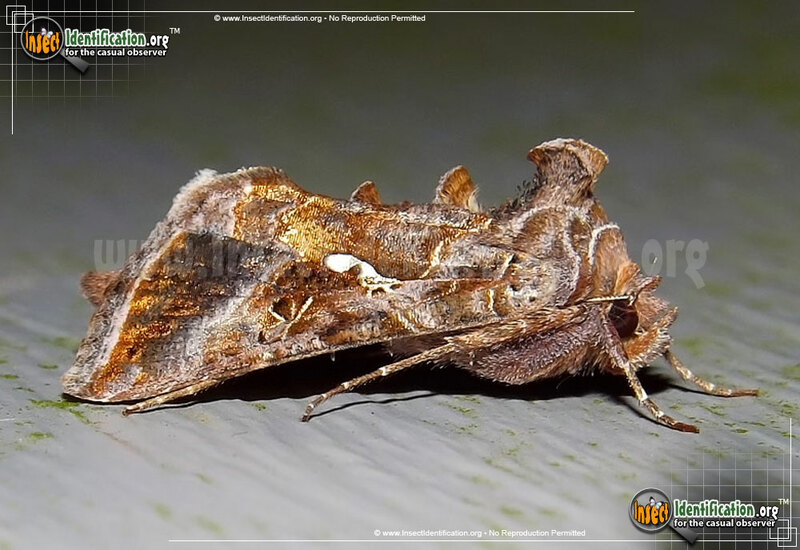 Adult Common Looper Moths are a mosaic of rich browns, metallic sheens and fine, white lines. This coloring helps camouflage the moth in wooded areas. They are similar in appearance to the Soybean Looper. The Common Looper may have an overall lilac hue. It has two obvious white spots on its forewings. The outer spot is solid white and the inner spot has a brown center. The two spots are usually connected by a thin white line that outlines both of them. The furry thorax area, just behind the head, is elevated as is a smaller patch of hair further down the middle of the body. An 'collar' of reddish-brown hairs sits behind the eyes. Adults are active from early spring through October. Looper Moth larvae create a loop shape with their bodies as they crawl. The center of the body arches into a ring-shape when the rear end is brought up just behind the head. Caterpillars for the Common Looper are bright green, like the leaves and stems they sit on as they feed. Their round bodies are plump and fleshy with a thin, white line on each side running from head to rear. A think black line above it adds contrast, making the white line more apparent. The head has a black mark on each side near the eyes. These larvae eat from a variety of low-growing plants including cabbages, beans, plantains, dandelions, carrots, and members of the aster family. Three or more broods can be produced each year. Look for clusters of circular, black eggs with a white spot in the center on the underside of leaves.